We’d love your help. 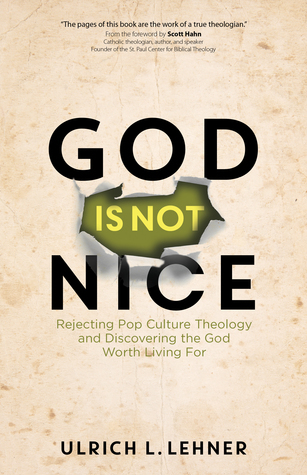 Let us know what’s wrong with this preview of God Is Not Nice by Ulrich L. Lehner. Ulrich L. Lehner reintroduces Christians to the true God—not the polite, easygoing, divine therapist who doesn’t ask much of us, but the Almighty God who is unpredictable, awe-inspiring, and demands our entire lives. Stripping away the niceties with a sling blade, Lehner shows that God is more strange and beautiful than we imagine, and wants to know and transform us in th Ulrich L. Lehner reintroduces Christians to the true God—not the polite, easygoing, divine therapist who doesn’t ask much of us, but the Almighty God who is unpredictable, awe-inspiring, and demands our entire lives. Stripping away the niceties with a sling blade, Lehner shows that God is more strange and beautiful than we imagine, and wants to know and transform us in the most intimate way. To ask other readers questions about God Is Not Nice, please sign up. As I so often complain, the quality of modern discourse is atrocious. Probably this is due to everyone being told for decades that his opinion always matters, along with a belief that democracy means all opinions are equally valid regardless of reasoning, capped off by modern avenues of communication that allow easy, free broadcasting of stupidity, when in the past dumb people had very limited ability to force the rest of us listen. Worthless discourse exists across the political spectrum, of co As I so often complain, the quality of modern discourse is atrocious. Probably this is due to everyone being told for decades that his opinion always matters, along with a belief that democracy means all opinions are equally valid regardless of reasoning, capped off by modern avenues of communication that allow easy, free broadcasting of stupidity, when in the past dumb people had very limited ability to force the rest of us listen. Worthless discourse exists across the political spectrum, of course, although that the Left dominates popular media means the average person probably has to suffer more from being bathed in drivel from that side of the spectrum. A subset of this general problem is that religious discourse is of equally low level, though rather (in most cases) being vicious irrationality, it is vacuous irrationality. It is this vacuous irrationality, at its core the idea that God is “nice,” that Roman Catholic theologian Ulrich Lehner is here to dismantle, in this brief and accessible book. Lehner’s point is that the usual modern American view of God, that he is “nice” in the same way as an avuncular grandfather, is a pernicious innovation. God is not here to make us feel good, nor is he here to dispense treats if we ask in the correct way. Rather, he has created us to make us, Lehner says, “partakers of the divine nature” (quoting 2 Pt 1:4). In short chapters, Lehner outlines certain characteristics of what Christians believe that divine nature to be: one of thunder, terror, surrender, intimacy, consolation, incarnation, rebirth, and adventure. The author, a professor at Marquette, begins by talking about what his students usually believe about God—namely, they have uninformed, sentimentalist, egocentric thoughts about God, when they have any concrete thoughts at all. Most of all, they deny, implicitly or explicitly, both that there are truths to be had, that those truths exclude contradictory falsehoods, and that those truths are difficult, especially in the demands they necessarily make of us. Lehner then briefly covers older (though better thought-out) tendencies similar in content, such as Pelagianism and deism, all as background to explaining the real Christian view of God. Each subsequent chapter is short and to the point, and written to a general audience, not to theologians. When Lehner says God is a God of thunder, he means that the simpering emotivism that characterizes most discussion about God not only fails to capture, but is antithetical to, God’s real nature. Such emotivism is also used to undermine religious discourse, with facile phrases about “forgiveness and love” being used as the sole rationale for the claim that God does not require anything substantive of us, and also for the necessarily related defensive claim that anyone who says otherwise hates both forgiveness and love, each more than the other. But, “As a theologian, I ask why God is love and what forgiveness entails and whether it can be bestowed on someone who does not ask for forgiveness. I look for reasons, not opinions.” We are to search for objective moral standards, not, as is the usual pattern today, to claim that they do not exist, because love. (As the atrocious slogan goes that is used to justify whatever dubious activity wants justification today, “Love is love is love is love.”) If we fail to appreciate that God demands certain things from us, we end up with the usual modern situation, where “The God of Abraham, Isaac, has become the god of Walmart,” a pleasant greeter saying hello and helping you to find what you want, not what he wants. Next Lehner covers the utter surrender God demands; he liberates us because he loves us, but that implies nothing less than a total commitment in response. What this should do for us is make us understand that sin is not a stain we can simply brush off, but a rupture with God, that needs substantive repair. And God’s liberation of us also implies a total commitment to loving our neighbor, a “thou,” not the general category of neighbors (as is common in these days of virtue signaling and substitution of political activity for concrete actions toward concrete people). Love does not mean absolving yourself or others of guilt, though—quite the opposite. Finally, Lehner covers the intimacy, the self-exposure, being open to God requires; the question of the consolations offered in this life by God; incarnation and rebirth (in which he treats original sin, freedom and redemption); and the adventurous, enchanting nature of God, who offers us an adventure as well. As far as the consolation of God; Lehner touches on theodicy, but he does not touch on the most common “Nice God” response to that problem, which is to recite in a talismanic fashion, “I believe everything happens for a reason,” by which is meant that God has a hidden purpose behind the most hideous events, which will be revealed to us in the fullness of time. I have been blessed with, so far, no immediate tragedy in my life, so perhaps this is easy for me to say, but as David Bentley Hart has pointed out, what God promises us is not the unveiling of such a grand synthesis, but the wiping away of tears, and the remaking of all things: “Behold, I make all things new.” Lehner does point out that part of Christian theology is the ultimate revelation of the downstream effects of our sins, but that is, if you think about it, the opposite of showing how those sins were part of God’s plan. Related to theodicy is Lehner’s criticism of the modern tendency to see health as the highest good. This is also a product of the Enlightenment—I am currently reading Paul Rahe’s "New Modes and Orders in Early Modern Political Thought," which exhaustively catalogues the philosophical turn to human comfort as the highest good during the Enlightenment (something Rahe appears to endorses, as a Straussian, but I will discuss that in my review of that book, not this one). Of course, those who worship a (factually inaccurate) picture of the Enlightenment, like Steven Pinker, also agree that this change to the effective worship of health is an improvement, which it is—if, and only if, God is merely, or at all, nice. I want good health for myself and my family, and for everyone, as much as the next person. I am greatly blessed in that regard, but I will not always be, and Lehner informs us it is not the highest good. In fact, we should not be heard to complain when God fails to deliver us perfect health, or even good health. God is not mean. But He's certainly not nice, and we shouldn't want Him to be. Because a "nice," harmless duffer of an "Old Man Upstairs," who doesn't hold us accountable or demand that we change our lives, not only wouldn't bother saving and transforming us, but wouldn't be powerful enough to. Lehner astutely notes that nice people wouldn't walk with us in our despair or share our pain; a nice god wouldn't, either. Indeed, the word "nice," seemingly akin to virtuous these days, meant quite the God is not mean. But He's certainly not nice, and we shouldn't want Him to be. Because a "nice," harmless duffer of an "Old Man Upstairs," who doesn't hold us accountable or demand that we change our lives, not only wouldn't bother saving and transforming us, but wouldn't be powerful enough to. Lehner astutely notes that nice people wouldn't walk with us in our despair or share our pain; a nice god wouldn't, either. Indeed, the word "nice," seemingly akin to virtuous these days, meant quite the opposite at one time: it meant something more along the lines of "stupid." Best stick with the real God of Abraham, Isaac, and Jacob. That God loves us. That God wants us. That God became man so that we might participate and share in His divine life. This is an incredible book. It’s a blistering attack on “therapeutic deism”. Or, as the author puts it, replacing the Father in heaven with a grandfather in heaven - a sort of senile benevolence. The author does a fantastic job at describing how far we have strayed from the true God - the God described in the Old Testament, the God who seeks to transform us. The only reason that I’ve given this book 4 stars instead of 5 is that it is quite short. This author no doubt has quite a bit to say, as he This is an incredible book. It’s a blistering attack on “therapeutic deism”. Or, as the author puts it, replacing the Father in heaven with a grandfather in heaven - a sort of senile benevolence. This book addresses something that has bothered me for a long time. There is a tendency in many new churches to celebrate God as if he were our psychotherapist or doctor or all-understanding friend. The deeper I get into liturgical worship I more I understand the need to kneel before him in fear and trembling. He is the creator of the universe. I am here to serve Him, not the other way around. A challenging read - but full of insight and uncomfortable truths. This is the God I want to worship! The author breaks down the door of the timid and goes right at the heart of the insidious evil that haunts the church. Good Words. A worthwhile read aimed at the general reader. I’d have preferred something that dug deeper into some of the points made. An excellent resource for the preacher or religious educator. Found myself confused about the audience for this book. It felt too cliched to be used in a professional setting. It offered some thoughtful reflections, but overall I was a bit underwhelmed.